A spectacular show of fire, performed by professionals in the art of dancing with fire and drums that will enhance the night. With an expansive repertoire, he can perform as a single guitar player or accompanied by a band, depending on the desire sound effect, the quantity of the musicians depends on the genre, call it Ballad, Jazz, Blues, Bossa, Disco and also Dancing Music in Spanish. In order to achieve a great versatility a quartet is suggested. Gonzalo can play for your important evening event, the most popular songs from different genres: English Ballads, Blues, Jazz, Rock, Latin Music, Caribbean, etc. If you prefer a single genre, please just let us know. This amazing dancing frame with live pre-Hispanic music, will recreate the Mayan cosmogony, an ancient people who celebrated the ending of each solar cycle at the renewal of fire given by the Gods, preparing themselves for the new millennium by making human sacrifices. The band is made up by an octet: female voice, male voice, brass section: tenor sax, alto sax, flute, trombone and trumpet and rhythm section: keyboards, guitar, drums and percussion. The group repertoire includes international music in English, Spanish and Portuguese as well as Latin rhythms with a very unique touch once their members are from different nationalities: 3 Mexicans, 3 Cubans, 2 Argentinians and 1 Colombian. Covering the whole Riviera Maya and Cancun areas, the band has enjoyed great success playing in many different kinds of gigs such as conventions, weddings, graduations, etc. The Mexican music history is plagued with different kind of rhythms for all occasion, the Trio music is especially romantic at the Mexican style, and it is used for serenades and for people who are in love, a very elegant music for a welcome cocktail. A group of talented and professional musicians with more than 15 years of experience. The Mexican band integrates vitality and creativity in their entertainment. With versatility and the ability to adhere to the crowd, the group can play a variety of genres with precision, from Rock to Reggae and everything in between. They have performed for many corporate events, including shows at Hard Rock Café, Carlos & Charlies, Planet Hollywood and the Jazz Festival in Cancun, among others. By naming your night theme, a professional DJ will lead the party to its climax, if you prefer a Karaoke party can also be conducted by this experienced DJ that will lead the audience to have the greatest time, ideal for a welcome reception. Enjoy a traditional ritual with a unique presentation that explains about the history and process of the tequila, conducted by a tequila master during a length of 25 minutes. 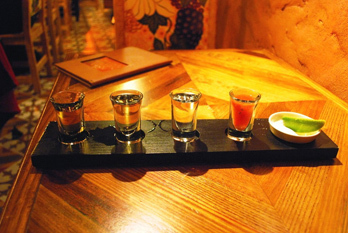 When the presentation concludes, you will sample the real flavor of tequila and learn to be an expert judge between three different types of this Mexican treat. Lauro’s Cigar House offers only Premium Cigars, with the necessary characteristics to satisfy the pleasure of selective smokers. Cigars are elaborated with a careful selection of tobacco leaves of the highest quality in the world, our specialized technicians trained in the Republic of Cuba preserve the ancient formula to achieve all but the best cigars in the world. No meeting or incentive program should be without the lights in stars of fireworks. MIE can customize fireworks for any budget including logos and the biggest surprise evening. We will build a private market with knowledgeable sellers and a variety of items for shopping. Our artisans will display souvenirs such as, pewter, talavera, tequila, vanilla, hats, bags, jewelry… you name it! Guests may redeem their “Company bucks” for purchases. Vendors will take cash (pesos or USD) or credit cards for additional purchases.